Nutcracker ballet is a world-loved story that is performed by famous ballet companies all across the globe. It is a Christmas special and one that will leave you enchanted, excited and full of joy. It is true that the Nutcracker is full of dreams and imagination, it a story that will captivate you from the very beginning. Especially as a performance, it is bursting with energetic dancing, beautiful music and spectacular costumes. The Nutcracker ballet begins on a Christmas Eve party and the characters are full of spirit, greeting their friends and passing on their presents. The Christmas tree is all set, the gifts are taking place and everybody is cheery with a party atmosphere. A young girl, Clara, welcomes all her friends along with her little brother Fritz. The young children are wildly entertained by magician Drosselmeyer and he captures everybody's attention. He is full of tricks and keeps the party alive, presenting life-size dolls where they each take a turn to dance. Drosselmeyer has brought gifts for the young children and for Clara, she gets a Nutcracker doll. Clara is thrilled with her present and already falls in love with her precious doll, but her brother Fritz is grabs the doll off her and is breaks the Nutcracker. Luckily, Drosselmeyer manages to mend the poor broken Nutcracker and Clara is reunited with her beloved doll. As the party draws to a close, the guests leave and the family get ready for bed. After everyone is asleep, Clara sneaks downstairs looking for the Nutcracker but when the clock strikes midnight, everything changes. The Christmas tree grows is a gigantic size and fills the whole room. The toys around the Christmas tree begin to come to life and Clara is suddenly surrounded by an army of mice, lead by the Mouse King. 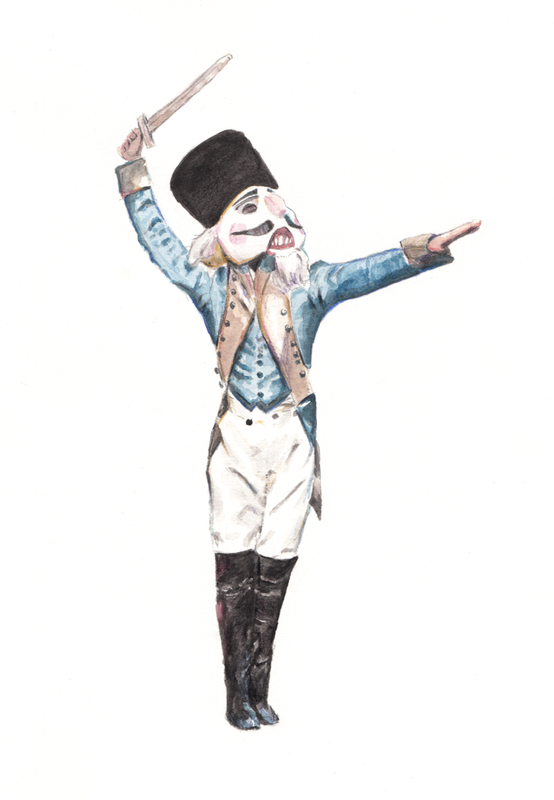 The Nutcracker springs to life and leads his toy soldiers into battle with the mice. The fight continues, but Clara can see the Nutcracker is in trouble and he about to be overpowered by the Mouse King. Clara makes a daring move to try and save the Nutcracker and she throws her shoe at the Mouse King. The shoe hits the Mouse King straight on the head and he drops to the floor. The rest of the mice run away, taking their King's body with them. The Nutcracker drops to the floor; he's exhausted and lifeless. Clara takes him in her arms and desperately tries to bring him back to life. He steadily comes back and Clara is amazed to see he is a handsome prince. They dance together and he guides Clara to the Land of Snow. Clara and the Nutcracker ballet arrive at the Kingdom of Sweets, a fantasy world which is ruled by the Sugar Plum Fairy. The characters in the Kingdom of Sweets perform special dances for Clara and the Nutcracker. There is a Spanish Dance, a Chinese Dance, an Arabian Dance and a Russian Dance, all from the different lands of the Kingdom. The Sugar Plum Fairy appears and performs a beautiful solo and Grand Pas De Deux with her partner. The Nutcracker Prince and Clara dance together, but just as their dancing reaches its climax, the fantasy world disappears. Clara awakens back inside her house beneath the christmas tree, realizing that it was all perhaps a dream.